"HERD is a rare thing: a book that transforms the reader's perception of how the world works". "This book is a must. Once you have read it you will understand why Mark Earls is regarded as a marketing guru." This paperback version of Mark Earls' groundbreaking and award winning book comes updated with new stats and figures and provides two completely revised chapters that deal with the rise of social networking. Since the Enlightenment there has been a very simple but widely held assumption that we are a species of thinking individuals and human behaviour is best understood by examining the psychology of individuals. It appears, however, that this insight is plain wrong. The evidence from a number of leading behavioural and neuroscientists suggests that our species is designed as a herd or group animal. Mark Earls applies this evidence to the traditional mechanisms of marketing and consumer behaviour, with a result that necessitates a complete rethink about these subjects. 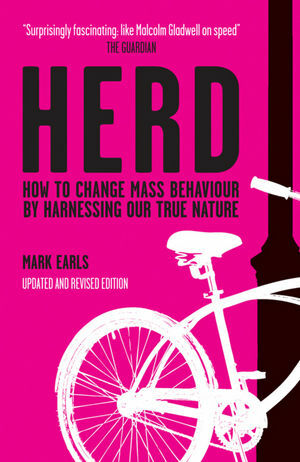 HERD provides a host of unusual examples and anecdotes to open the mind of the business reader, from Peter Kay to Desmond Tutu, Apple to UK Sexual Health programmes, George Bush to Castle Lager, from autism to depression to the real explanation for the placebo effect in pharmaceutical testing. Mark Earls is one of the leading thinkers about brands, marketing and mass behaviour. He has held senior positions in some of the largest and most influential communications companies in the world – his last job was as chair of Ogilvy’s Global Planning Council, prior to which he was Planning Director at the revolutionary St. Luke’s Communications in London. His written work has regularly won awards from his peers and is considered by many to be amongst the most influential being written about consumer and mass behaviour today. His first book, Welcome to the Creative Age, was widely read and discussed and has been translated into several languages. HERD has received recognition and praise in a number of fields and Mark has travelled extensively to talk about HERD with audiences drawn from both the business and the public sector. Mark lives in North London but would rather be watching cricket or fishing, ideally somewhere sunny. Uses a host of unusual examples and anecdotes to open the mind, from Peter Kay to Desmond Tutu, Apple to UK Sexual Health programmes, George Bush to Castle Lager, from autism to depression to the real explanation for the placebo effect in pharmaceutical testing.